My family goes bonkers for potato skins. It’s an appetizer that is sure to please everyone. Recently, I tried something a little different and made BBQ Chicken Potato Skins. They were out of this world and hearty enough to be a meal in itself. I don’t think I’ll ever go back to using bacon as a potato topping again. These potato skins are delish and so simple to prepare! Many thanks to KC Masterpiece and DataRank for today’s sponsored recipe. This recipe is a great way to use up leftover BBQ chicken from the weekend’s cookout, or you can do like me and prepare the chicken in the slow cooker. Just 3 1/2 to 4 hours in the slow cooker yields the most perfect pull apart chicken. 1. Cook the chicken in the slow cooker. Add 2 boneless, skinless chicken breasts to a slow cooker. Spoon over 1 cup of BBQ sauce. Add 1 cup of water. Cook on low 3 1/2 to 4 hours. Once chicken is fully cooked, remove from slow cooker and shred with a fork. Place in a bowl and stir in an additional 1/4 cup BBQ Sauce. 2. Preheat oven to 400 degrees. Wash potatoes and pat dry with a clean dish towel. Place potatoes on a cookie sheet, using your hands coat with olive oil. Sprinkle with salt and pepper. Bake in 400 degree oven for approximately 20 minutes or until fork tender. Remove from oven and allow to cool. 3. Slice each potato in half lengthwise. Scoop out the center of each potato. Fill the center of each potato with shredded BBQ chicken, and top with grated cheese and sliced green onion. Place filled potato skins back into the oven for a couple of minutes, until the cheese is melted. 4. Serve with a side of your favorite BBQ sauce. Enjoy! These look soooo good! Two of my favorite food items combined! oh, i am hungry. I never thought of making a BBQ chicken potato skin. This is a great idea for the summer and EASY. Oh yum, I love twice baked potates but never considered trying this! It looks great! Oh yummy, almost everyone in our family loves potato skins! I love potato skins and this looks so yummy. Oh now i am feeling hungry.These look really amazing and tasty. I see that they are loaded with gooey cheese and anything loaded in cheese like that has to be good! Oh love the added chicken to a normal loaded potato looks great. oh my goodness this sounds amazing, I am going to have to try this BBQ sauce – we love to BBQ! WOW-this looks great!! thanks for sharing–we have to try this out for sure! Great for game day! Delicious! Oh, wow these look SO delicious! 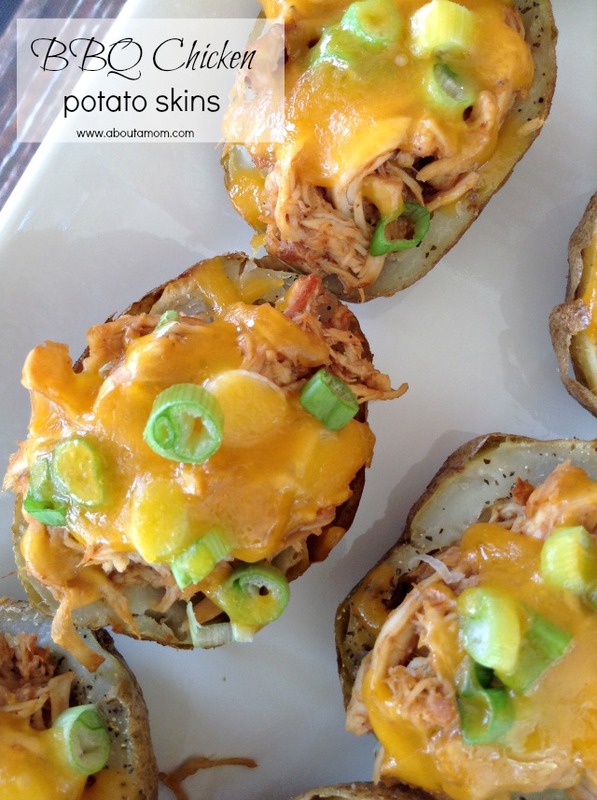 I love potato skins, but your version gives them such a yummy BBQ twist! Here you guys go, making me hungry again! This looks delicious! Those look so yummy. They’re seem super easy to make =- perfect for a cookout or a casual get together! I really want to make these for dinner tonight. Yum! I love potato skins, and these sounds really good. These look so amazing, my husband would looooove these! Oh yum, these look really good! I am a huge potato skin lover and I like this new twist of flavors! 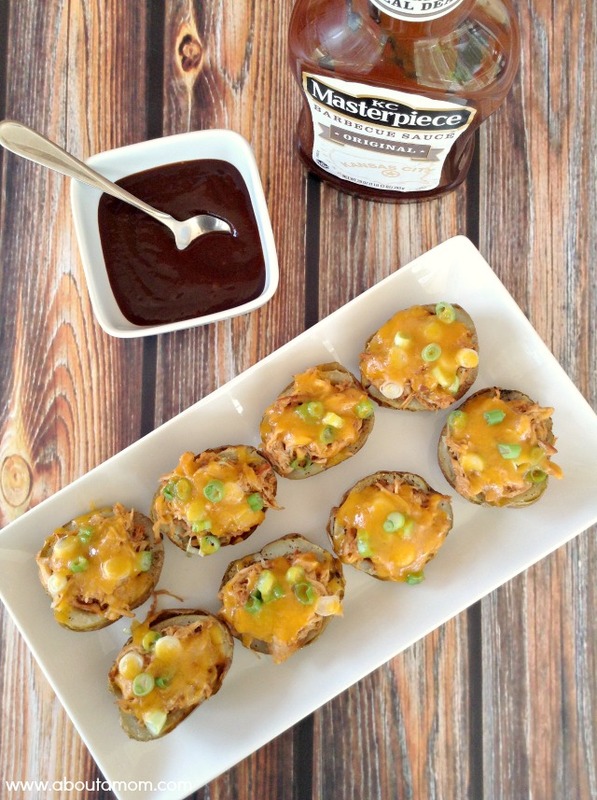 Ermagoodness, the BBQ Chicken Potato Skins look SO good! Adding potatoes to my shopping list. My stomach serious sat up and said “Hey NOW” when I saw this photo! It looks delicious!!! These look delicious! I think I’ll make some for dinner tonight. thanks! These look absolutely delicious! I can almost smell them the photo looks so real! Your food always looks so tasty!! Pinned It! Wow!! its a good thing I ate a late lunch or these would totally make me hungry! They look absolutely delicious! delish. I will have to show my husband maybe he will feel prompted to make dinner tonight. I just pinned this. I mean, how could I not? It looks so good. Thanks for the recipe! I love baked taters and my husband loves BBQ. Perfect for us both. These look so yummy! I am not normally a potato skin fan- but if you put meat on it…. YA!!!! KC MASTERPIECE is the best!! Those look delicious!! Those potato skins looks really delicious. I like that you put a BBQ twist on them. I’ll have to make these soon for dinner one night. These look and sound absolutely amazing. I wish that my diet didn’t cut out potatoes, as they’re one of my favorite foods. Omg those look awesome. YUM. I haven’t had potato skins in forever!! These look delish – thanks for the recipe! You know I’m all about potato skins 🙂 This is a great idea to turn one meal into two and the combination of bbq with the potato and chicken is very refreshing. Ooh, what an awesome appetizer for when we have people over for a bbq! Mmmm, mmmm good. Those are right up my alley. They sound so good! These look fantastic. I can see me making these for parties, especially during football season. Wow, this looks so good. I am pinning this to my pinterest board! These look REALLY good. Is it football season yet, this is the best tailgate food! Wow. These look great. I’m going to try and make them. I just hope they turn out as nice. These look so incredible, I just can’t eat them! 🙁 I can no longer eat potatoes, but once upon a time they where my all time favorite! This looks really good! I think they will be dinner this week! Oh that looks really delicious and I’m sure the kids and the husband would love it. I don’t particularly use KC Masterpiece but may just get a bottle to try this with. Thanks for sharing. Those look and sound amazing! Perfect for a Summer BBQ with friends and family! Oh my gosh!! This looks soooooooo good! We went out to dinner lastnight and I had them load up my fries like this, minus the chicken. But we have potatoes often at home. I have to try this. Might surprise my husband. We’ve never thought of adding chicken! Those look great. We grill out a couple of times a week…I’ll ask my husband to make extra chicken. I want to try theses. Yum! I love potato skins. This is an easy way to turn them into a meal. Oh gosh, that looks so good! These look so so so good!! And so simple to do! This is such a great idea – two great things that will taste great together! Okay those look delicious!! I need to try this recipe. Two things I love together?!? These look awesome! Oooo these look delish! Great game day recipe for the fall! These look delicious, I love that you added chicken to them! I never would have thought to add bbq chicken to my potatoes. Oh my, these look so delicious and much easier than I would have thought they would be just by the picture! Definitely looks like something you would get at a restaurant, only better! This sounds divine! What a creative spin on a classic! This is a great combination and it looks mouth-wateringly delicious. These look so bad for me but oh so good! Yummmmmmy! These look absolutely delicious! Thanks for joining the Monday Funday Link Party! Sounds great. I usually just add cheese, never thought of adding other stuff! Will give it a try! Thanks Cheri! On the top right of our sidebar, the RSS symbol goes to our daily email opt-in. We’ll need to get the Bloglovin button back up on the blog. These sound awesome! These would be nice and filling in colder months too. Yum! What a delicious spin on the potato skins! I love KC Masterpiece! These skins look delicious. Thanks for linking up with Wonderful Wednesday Blog Hop. We are so glad you came. These look so delicious! Thank you for sharing at The Wednesday Round Up! We hope to see you back next week to party with us again! These sound wonderful! Stopping by from the Wake Up Wednesday party. So utterly delicious! Thanks for coming and linking up at The Weekend Social. Please be sure to come back next week starting Thursdays at 9PM EST on culinaryflavors.gr ! I hope to see you there! That sounds like a great way to enjoy some BBQ chicken! Perfect snacks for game day this fall too. Just printed this to add to my recipe book. Looks amazing! This look delish. What a great thing to serve at our summer bbq’s. These looks delicious! I can’t wait to make them! Just wanted to stop by and let you know we featured your BBQ Chicken Potato Skins at Wonderful Wednesday last night!! Yum 🙂 Also so nice to meet another Mother / Daughter blogging team!! Delicious and I love the idea of adding BBQ chicken for some extra protein! I’m such a sucker for twice-baked potatoes, I can tell this would be an amazingly flavorful variation on an old favorite! Thanks for sharing! I’m such a sucker for twice-baked potatoes, I can tell this would be an amazingly flavorful variation on an old favorite! Thanks for sharing the recipe! Pinned! Thanks for sharing and linking up to the Say G’day Saturday linky party. Hope you will be back to join us again this weekend. These look so awesome. These would be great for the 4th of July. These look so delicious. Will be making these for my family. They are going to love them. I really shouldn’t browse the recipe files when I’m hungry. This made my mouth water just looking at the pictures. What an awesome idea! I love bbq chicken and potato skins are favorites in our house and we always on the look out for new easy recipes. I am going to try this very soon. Wow, putting chicken in the potato skins is a great idea. I don’t think I’ve ever seen this before, I have got to try this one. thank you for sharing this recipe. What a genius idea! These look absolutely delicious! These look very tasty and something the whole family would eat! I know my family would go nuts over these awesome delicious stuffed potato skins. I like that they meat is barbecued. Thanks for sharing. These look so good. Perfect for a tailgate. Would love if you linked up with us at Mommy Needs a Timeout Thursday. Party starts at 8pm EST on Wednesday. See you there! Hey there! Just saw these babies at the link party and can’t wait to try them. I love the BBQ chicken and potato skin combo. A perfect all-in-one meal! Pinning! These look so good! Thank you for sharing at The Wednesday Round Up and we hope to see you back next week! I love BBQ anything! Inside potato skins is sure to be great. These potato skins look delicious! Love that their filled with BBQ Chicken. Come link up at Treasure Box Tuesday. What a great little meal! Thanks for linking up with SNF! Pinned to our party board!! My family would go crazy for these! Thanks for linking up with What’s Cookin’ Wednesday! Hello cute ladies! This looks so yummy. Pinned. We couldn’t think of anyone better to party with. We hope to see you tomorrow at 7 pm.